I love truffles! Especially dark chocolate truffles! I have made truffles several different ways and these are definitely the easiest. I am almost embarrassed to share this recipe because it is so easy! I make these for teacher gifts (some teachers have even requested them) and put them in a cute little tin or jar. The minimal effort in making these does not mean I appreciate them any less, but I do feel a little guilty when anyone is impressed by them. Ready for the recipe with step by step pictures? It took me longer to edit pics and blog about these truffles than it did to make them. These are your ingredients. Yup. That is it! One pack of cream cheese (I think I do prefer Philadelphia just a bit) and two bags of Hershey's Special Dark chocolate chips. You can use other chocolate if you prefer, but this is my favorite. Melt the chocolate for one minute at 50% power. Stir. Place chocolate back into the microwave at 50% power and stir every 30 seconds until melted. Put the cream cheese in a medium mixing bowl. I guess you could soften it, but it always seems to be soft enough for me to work with. Your call. Pour the melted chocolate over the cream cheese. Mix the chocolate and cream cheese together. You are going to need some sort of mixer for this one, especially if you didn't soften the cream cheese. Roll the truffle mixture into little balls. I have a small cookie scoop that is the perfect size and keeps them pretty uniform. Place the truffles on a wax paper covered cookie sheet. Place the truffles in the refrigerator or freezer until they are firm. Melt the second bag of chocolate chips as before. I like the chocolate a little thick so I do not add any wax or oil. I am not great at chocolate coating, though, so do whatever works for you! Dip the truffles into the melted chocolate. I just use a fork and tap off the excess chocolate before placing them back on the cookie sheet. Since the cookie sheet should still be cold the chocolate hardens right away. That is it! Easy, right? You don't have to share the recipe. No one will know. 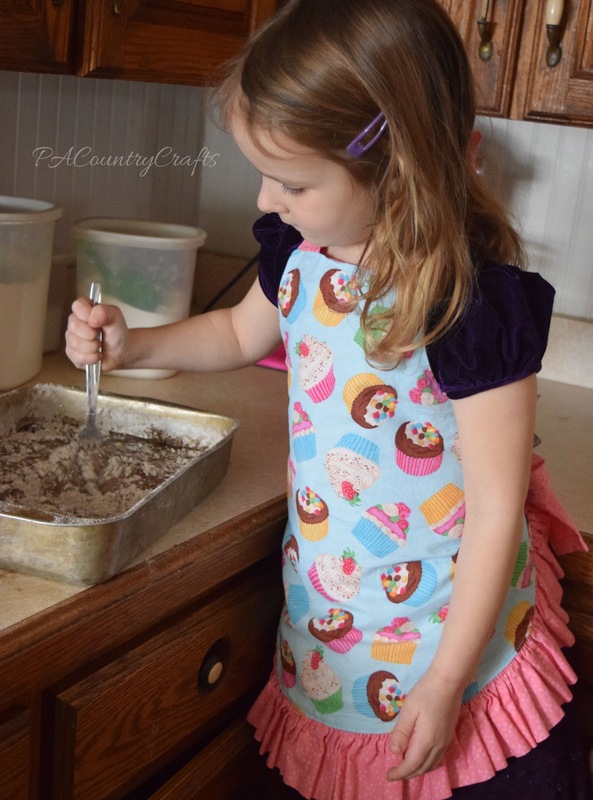 Today I am sharing one of our best family recipes! 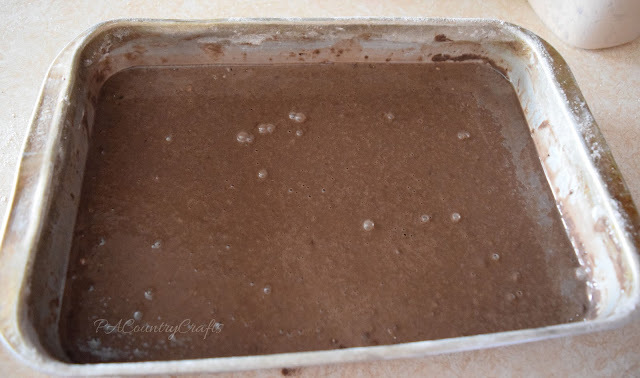 We always called this "Silly Cake" because it has no eggs and mixes up right in the pan. 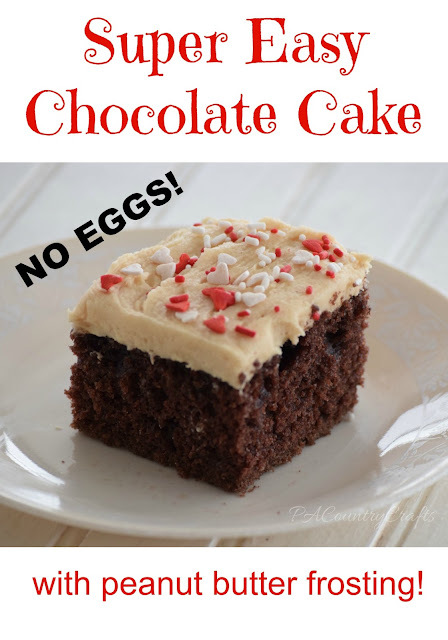 It is perfect if you have an egg allergy or if you ran out but still want chocolate cake. Also, having no bowl to wash is great if you don't like washing dishes. Are you sold on this cake yet? You should be. It is awesome! Also, I think the chocolate cake with peanut butter frosting (actually, we say "icing") is pretty much a standard dessert where I live. It might be a PA Dutch/central PA thing. Peanut butter and chocolate are a great combination, so it just makes sense. But, there is a funny story behind this cake recipe. I mention on my "about page" how I used to be an awful cook. 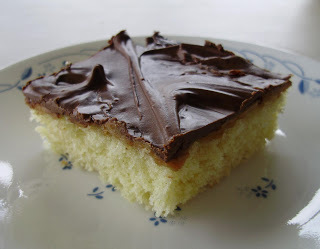 Well, the first time I tried to make this cake, I used tablespoons for everything. Salt, baking soda, etc. When it came out of the oven and looked a little funny I was very insulted because Mom didn't want to put icing on it until we tried it. Poor Dad got the first piece. We asked if it was OK and he shook his head "yes", then his eyes got wide and he violently shook his head "no" as he rushed to spit it out. He said that he had never had a cake grow in his mouth before! Thankfully, I learned the difference between tablespoons and teaspoons. Don't let that story scare you. My 4yo and I made this cake last week and I took pics so that I can show you how easy this cake is to make. Mix the dry ingredients together in a 9 x 13 baking dish. We usually use a metal pan but glass is fine, too. 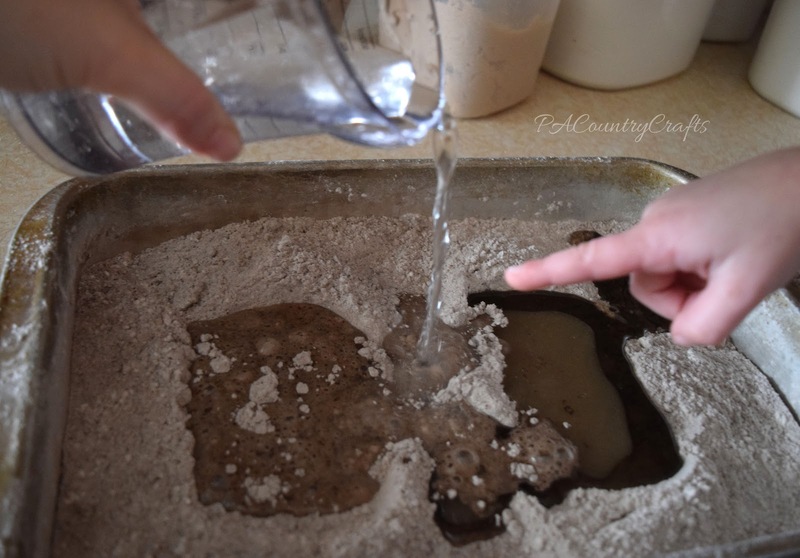 Next, make two wells in the dry ingredients. Put the vinegar in one and oil in the other. Bake at 350 degrees for 30-35 minutes or until a toothpick comes out clean when you poke it. Top with frosting (and sprinkles if your 4yo insists on them). 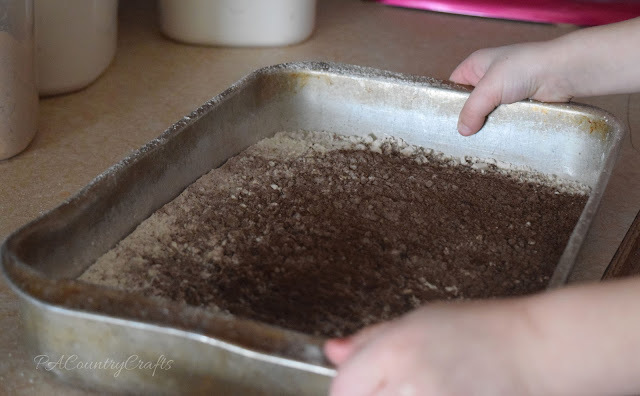 Combine dry ingredients in baking dish. 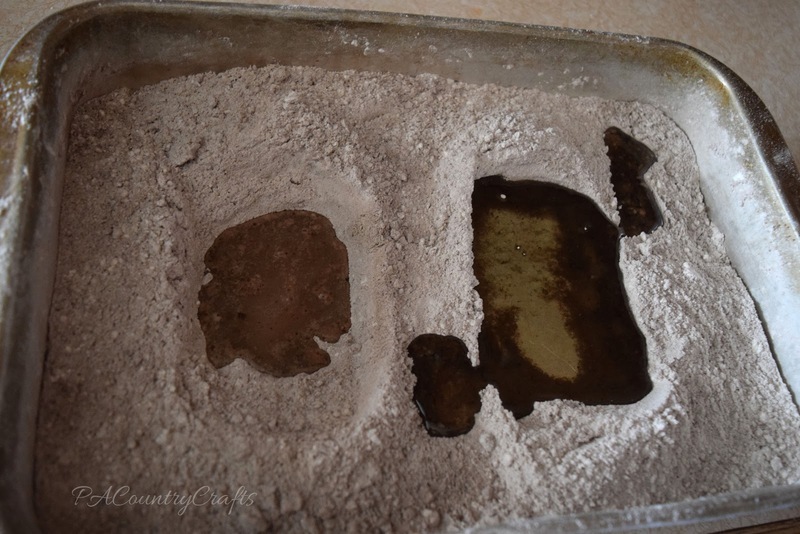 Make two wells in the dry ingredients for the vinegar and oil. Pour water over everything and mix well. Bake at 350 degrees for 35 minutes or until toothpick inserted in cake comes out clean. I like to just throw things together when I cook/bake. I saw Martha Stewart just dumping vanilla out once and was truly inspired! I NEVER measure vanilla anymore cause Martha doesn't do it so I don't have to! This non-measuring technique can get carried away sometimes. 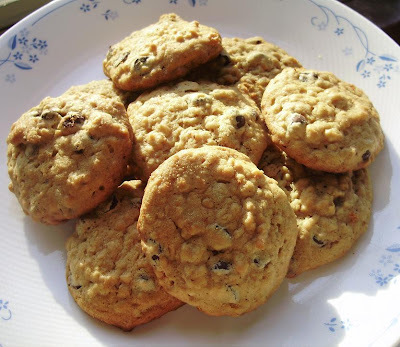 I was so hungry for oatmeal chocolate chip cookies and couldn't find a recipe. 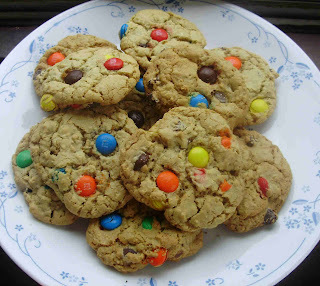 SO I just threw a bunch of stuff together and ended up with a DELICIOUS cookie! BUT this backfired because there was no recipe and it took about a half dozen attempts to recreate them perfectly. I finally got is, so here is the new recipe! Blend together sugars and margarine. Add eggs and vanilla. Stir in peanut butter and mix until creamy. Mix in dry ingredients and lastly, the chocolate chips. Drop in spoonfuls on cookie sheets and bake at 350 degrees until the edges start to turn lightly brown (do not overbake) about 10 minutes. We are currently experiencing zucchini overload here! So, I will be bombarding you with zucchini recipes! 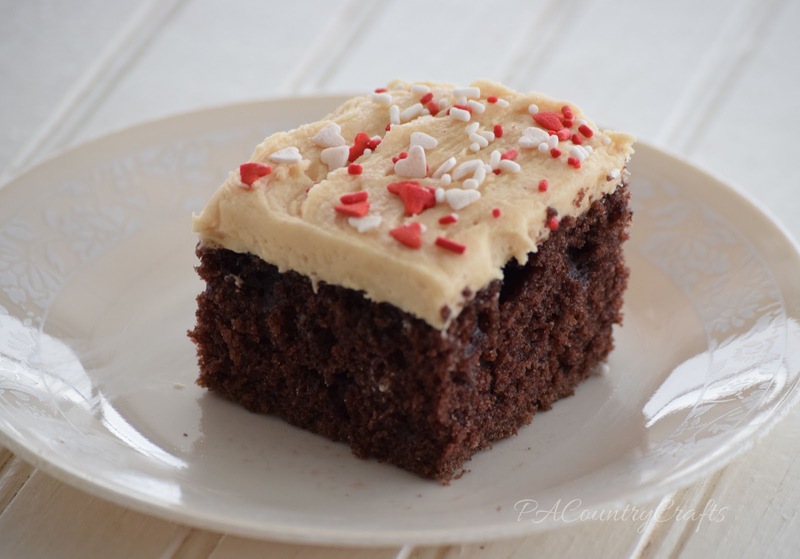 First up, this yummy, extra-moist cake is a delicious way to sneak kids their vegetables! Of course, my kids love their vegetables so much they fight over them! Cream first three ingredients. Add egg and vanilla. Mix. Add sour milk. Mix well. Add dry ingredients and stir. Mix zucchini in last. Pour into pan and sprinkle chocolate chips all over the top. Bake at 325 degrees for 40-50 minutes.